Home / Dog Whining / Why Does Your Dog Whine? Whenever you hear your dog whine, you may automatically think that he or she is in some sort of pain. While whining could certainly be a sign that your pooch is in pain, there are actually a variety of different possible reasons for a whining dog. After all, dogs can only communicate with their human owners in a few different ways, and whining is just one of those options. 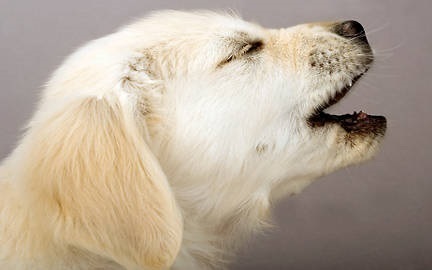 So, what exactly is your dog trying to tell you when it whines? To better understand your dog's whining, it is helpful to explore where this behavior originated. Just as crying is the first way human babies learn to communicate with their mothers, whining is the first way your pooch learned to communicate with its mother. This initial whining is your pup's automatic response to feeling hungry or cold. As a result, your pup's mother responds to those needs and the puppy learns that whining is an effective method for getting its needs met. After the puppy is weaned from its mother, it then has to learn how to effectively use whining to communicate with its human owner. The way you respond to the whining will greatly affect how often your adult dog continues to whine. If you completely ignore your pup's whining, it learns that whining is an ineffective method of communication and it may completely stop whining. If you come running every time the pup whines, on the other hand, your pup may come to rely upon this form of communication. Ideally, your response should be somewhere in the middle. If you completely ignore the whining, you and your pup will not bond properly. Being overly attentive, on the other hand, will make your pup overly dependent upon you to fulfill its needs. In many cases, a dog will whine simply because it wants attention from its owner. At first, this behavior may seem cute and you may actually reinforce the behavior by providing your dog with the attention it seeks. If you want to stop this behavior, it is best to avoid giving your pet attention when it whines - just be sure to give it love and affection at times when it is not whining. A dog may also whine when it is feeling anxious, such as when you are away from home or when your dog is otherwise unable to be with you - such as if you have the dog locked in another room or locked outside. In this case, your pooch may suffer from separation and you should discuss the problem with your veterinarian in order to discuss your options for reducing your pet's anxiety. The bottom line is that the way you respond to your dog's whining has a great impact on whether or not the behavior continues. If you want to prevent the whiny behavior, it is important to limit your response to whining when your dog is a pup. As an adult, be certain you do not reinforce the behavior and that you do reinforce other methods of communication for your pet.